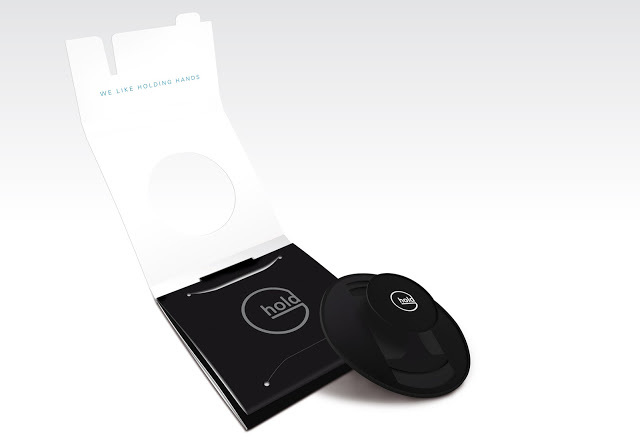 Mike DeSimone and Jeff Jenssen, aka US wine and travel experts the World Wine Guys, have chosen G-Hold as one of their favourite 'small things that simplify travel' in their latest Huffington Post article. "In the search for the perfect intersection of size and functionality, we have located some pint-sized pieces that overcompensate for their diminutive dimensions. "Whether you are taking a photo, reading in transit, or presenting in a board room, you can keep a firm hand on your tablet ... It rotates 360° to change viewing angles, and folds flat to fit in a case or sleeve." Read the full article over at the Huffington Post here. G-Holder Alison is in the USA at the moment and sent us back this brilliant image of Lady Liberty herself (next to her sister - Duchess of Liberty?) holding a G-Hold in New York. Jamie Carter at TravGear.com has written a review of G-Hold and given us an absolute gift of a phrase - 'pimp your 'pad' - love it! Click below to read the full review. 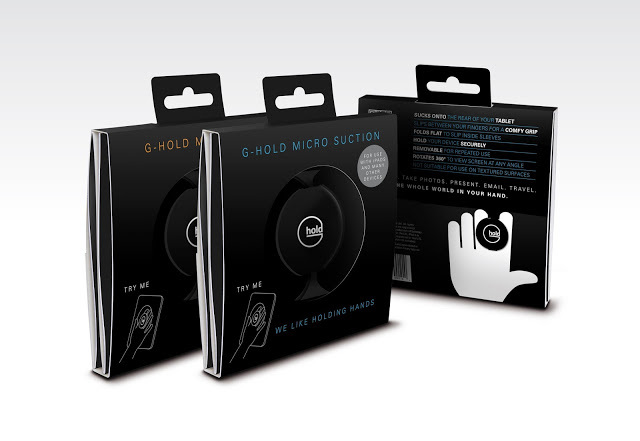 "If you’re like Suzi Perry and can’t do anything without an iPad in your hands, the G-Hold Micro Suction is for you. A lightweight plastic stick-on clasp that allows an iPad to be securely held in one hand, it makes hanging around with a tablet that much easier. It’s simple, ingenious stuff; you stick the 4.5-inch diameter G-Hold Micro Suction to the back of any tablet, extend the slide-able clasp and slide in between your index and middle fingers. The whole thing even rotates through 360 degrees, too." Greg Shultz at TechRepublic has written a fantastic review of G-Hold, which you can read on their site here. He tried out the G-Hold on two different tablets, the HP Stream 7, below, and the Dell Venue 11 Pro, and liked it on both devices. It's a really in-depth, great read, so please do check out his article as soon as you get the chance. Coffeedential, an Italian fashion and tech blog, has included G-Hold in its list of must-have smart gadgets for creatives. Alongside G-Hold, which, of course, is perfect for giving digital artists a firm, comfy grip on their device, Coffeedential has also recommended the Nomad Brush, a flexible, intuitive brush for painting and drawing on tablets, the Equil SmartPen that instantly transfers drawings on paper into digital form, and the very cool Oblige DIY sleeve, which can be customised with your own drawings and designs. Read the full article here and find out what gadgets Coffeedential chose in their Freetime and Office categories. G-Hold's packaging has been nominated for a Scottish Design Award, so Packaging of the World spoke with Adam Gourlay of Shaw Marketing and Design. Adam worked with our own inventor, Alison, to create the innovative look and function of the packaging. “It was important to capture the style and tone of the product and present what is a truly innovative piece of kit in an appropriately attractive way,” said Shaw designer Adam Gourlay. “This is a product that is essentially simple, elegant and effective and we wanted all of these qualities to come through in the packaging." "I’m still amazed at how a simple piece of plastic can give this much comfort and functionality for a tablet. If you’re looking for an accessory to make it easier to carry around your tablet, the G-Hold might just surprise you. It surprised me." G-Hold customer Vicky took to her blog to give G-Hold a five-star review, and we couldn't be happier. "I wanted to try the G-Hold as I thought it would be good for disabled and/or elderly, and it hasn’t been marketed towards these groups. My hand grip is fine but for someone with arthritis in their hands or fingers this would be a godsend as your fingers won’t lock, bent. The main use I thought it would help me with is when I fall, I am always paranoid that I will drop my iPad and break it. Since having the G-Hold I have fell twice when using it and each time was able to raise my arm without paying any attention to what position the iPad was in. When I fell before I got this I had to concentrate on what was happening with my pad to make sure I didn’t drop it or knock it into something like a door or table, but now I have more time to find something to grab onto with my free hand to prevent me falling to the ground, knowing that my iPad is safe." Raymond Walsh picked G-Hold as one of his top stocking stuffers for men who love travel, on the rather marvellous blog Man on the Lam. "This neat and unique Christmas gift sticks to the back of any tablet. It rotates 360 degrees, folds-flat for easy storage in any iPad or tablet sleeve, and is removable leaving no residue behind. Great for keeping a firm grip on your tablet in public or business presentations on the road. Their motto? We wanna hold your hand." Boo Paterson covers G-Hold's New York launch and CEO Alison Grieve's fascination with fellow inventor Carmela Vitale on her site Boo York City. "An award-winning inventor is on the hunt for the mysterious New Yorker whose brilliant idea stops your takeout pizza from being ruined before it’s delivered. Secretive Carmela Vitale invented the pizza saver – the little white plastic tripod that sits in the middle of pizzas to stop the box from sticking to the toppings. And though Alison Grieve – who invented the G-Hold and the Safetray – has been searching for Vitale for two years in her spare time, she has yet to even find a photograph of the secretive creator. Grieve said: “I started researching the inventors of the products we use on a day-to-day basis for a TV series idea that I had. “Carmela’s takeout pizza saver is used literally billions of times per year. I remember the days of having to scrape half of my pizza toppings from the cardboard and refashion them in a sludgy mess back on to the half-naked base. High street retailer John Lewis has revealed the 12 finalists of its 2014 ‘PitchUp’ competition; an annual initiative which offers retail entrepreneurs the opportunity to get their products stocked on its shelves. Backed by national pop-up shop campaign PopUp Britain, the 12 start-ups will now receive retail mentoring in order to get them ready to pitch their products to a panel of John Lewis buyers at the chain’s head office on August 1. Intended to support British innovation and give retailers their “first taste of the high street”, the finalists include lightweight luggage solution Gate 8, children’s board game Blank, and cycle safety light specialist Veglo. Our CEO and inventor Alison Grieve was interviewed for this great case study about crowdfunding on Ideas Cafe. Here is a brief extract, but you can read the whole story here. "Crowdfunding is no longer purely a means for new startups to get off the ground. Nowadays, already-established companies are taking to sites like Kickstarter to launch new products that, in turn, can produce tons of advantages -- including an intense learning experience -- beyond the up-front capital. We recently spoke with Alison Grieve, CEO and founder of Scotland-based Safetray Products, to get first-hand insight into her successful recent Kickstarter campaign that raised funds to manufacture her new invention, the G-Hold (grips and cases for iPad, tablets, and iPhone). Giving anyone a chance to be a part of a production process opens up the lines of communication between the producer and those interested in donating. That feedback can be essential. The key is in the connection with the backers. "You can really lose that connection if you have a business model of selling through distribution, wholesale or even retail," Grieve tells us. "Crowdsourcing gives you invaluable insight into the wants, needs and desires of your ultimate end user. It really is an unparalleled method of funding." Hearing someone's story firsthand can be the kicker. Think about it: who doesn't love to support the little guy? A crowdsourcing page can give businesses the chance to open up about their ambitions. It also can help potential backers understand businesses' perspectives and why they need the backers' support. "I got the sense that many backers are actually motivated by the desire to help in somebody's journey toward achieving their dreams- not just in the product itself," Grieve says. "It was a hugely emotional experience, and both myself and the team felt such gratitude for the kindness extended by friends and strangers alike." Young Company Finance profiles G-Hold and its parent company, Safetray Products Ltd, in the latest issue. Visit their website here to subscribe and see the full article. "G-Hold is the latest brainchild of Edinburgh-based hand-holding technologists Safetray Products Ltd, and is used to hold tablet computers and other mobile devices securely whilst on the move. " "US retailer Adorama will be launching the G-Holds at its NYC store this summer, and a non-exclusive distribution deal has been agreed for both West and East Coast USA with distributors SBC Global. In addition to consumer sales, the company intends to focus on professional tablet users in the areas of education, healthcare, retail and foodservice." G-Hold featured on the blog of Modahaus Photo Accessories. Read the full feature here, and don't forget to back our Kickstarter here - there's only 7 days to go. Don’t you find your tablet somewhat awkward to hold? Heaven forbid if you should accidentally drop this expensive item! The G-Hold is a nifty solution to all that fumbling. It is a clever backing designed to give users a secure hold on tablets and smartphones. The backing is attached to the device with either a permanent adhesive or with microsuction and will fit all sorts of devices from smartphones to tablets and eReaders. The G-Hold not only provides the user a natural way to secure their hold between the fingers but also allows the device to be easily rotated. There is also a beautifully made leather iPad case with an integrated G-Hold. Scottish inventor, Alison Grieve, came up with the idea of the G-Hold when she first starting using an iPad. Her innovation also derives from her considerable experience of how people hold things in her prior product, a non-toppling tray called Safetray. The G-Hold is a current Kickstarter project where her team hopes to raise the capital so “we can build a mold and then conduct our first production run” as well as pay for the first batch of leather iPad cases. The Guardian names G-Hold "Cutting edge British tech"
Fred McConnell of The Guardian named G-Hold in its list of Cutting Edge British Tech at CES 2014. Read the full story here. "If you are like me, you have dropped your share of devices. While that may not be too big of a problem for phones if you have a sturdy case, as you start to climb up the device ladder – in both size and cost – to tablets, it becomes more of a problem. If you have ever dropped, or worried about dropping a tablet, or if you want more mobility while using a tablet, consider the G-Hold. The G-Hold is the brainchild of Scottish inventor, Alison Grieve. Way back in 2009, Grieve invented the Safetray (right), a hospitality tray with a clip beneath it to slide your fingers through, which creates a friction and safe balance. The Safetray is really the inspiration behind the G-Hold, and is a natural progression. The G-Hold employs the same exact clipping mechanism, and is really a Safetray for a tablet. Although the G-Hold is not yet available for purchase, Grieve told us that they will be launching a Kickstarter campaign in the very near future. Also you can find Grieve and the G-Hold at CES at LVCC, South Hall 4 – 35577." Visit Techfaster here for all the latest tech news.